In order to make effective use of both time and materials, mistakes have to be minimized. Quality in, quality out. Measure twice, cut once. Get it right the first time. These statements and ideals are known across the construction industry, which like many other industries relies on accurate and comprehensive measurement data as a starting point for analysis, design, and investigation. Quality measurements are desired, but the thought of painstakingly recording them one point at a time increases concerns about the documentation efforts. And what if something is missed? Additional visits to the area to collect additional measurements that were missed the first time around are also undesired. The construction industry wants quality measurements,they want them fast, and they want them to be as accurate as possible. Does this sound familiar? Over the past 10-20 years, hardware and software engineers have been hard at work developing tools to suit these needs. 3D laser scanning has emerged as a tool and process that meets the demands of quality, comprehensive, and accurate measurements for these professionals. Through a combination of hardware, software, and methodology, 3D laser scanning now allows us to tackle the issues of precision and coverage with relative ease, and in a timely manner. Software manufacturers are also beginning to take notice, with companies like CAD giant Autodesk and others making a conscious effort to accommodate laser scan, or “point cloud” data, in their major software packages. Engineers, architects, and contractors now have the ability to work directly with point cloud data inside applications such as AutoCAD, Revit, Navisworks, Bentley Microstation, and even Google Sketchup. The ability to edit and manipulate the measurement data directly inside your application of choice has many benefits, including clash detection analysis, and virtual site management. Laser scan data proved invaluable when we recently partnered with the National Park Service (NPS), the federal agency administering many parks throughout the country, and CyArk, a non-profit organization dedicated to preserving the world’s heritage sites through digital preservation. As part of this partnership, the NPS selected the Lincoln Memorial to be a pilot project in its broader goal of digitally documenting the National Mall in its entirety. The scan data collected will be used for a variety of purposes, among them structural integrity evaluations, site management and maintenance, as well as providing additional value to the existing education programs offered by the NPS. Similar to construction projects, the initial measurements will be used as a foundation upon which many important decisions will be made for years to come. The project assignment was to utilize 3D scanners to digitally document all aspects of the the Lincoln Memorial. The time frame to perform the Lincoln Memorial documentation was five business days, working within the typical permit hours of 7 a.m. – 5 p.m. The extent of the project included everything on the outside of the site, and within the Lincoln Memorial Circle; the roadway that surrounds the monument. On the interior, the project called for data collection on the top portions of the Lincoln Statue in the main chamber, as well as thorough documentation of the attic, roof, and basement areas. Like any construction project, the unique features of the Lincoln Memorial presented their own distinct challenges for documentation. Areas such as the attic, roof, and basement required special consideration. In the attic area, the versatility of the 3D laser scanner, and its comprehensive field of view, allowed for accurate data collection while adhering to OSHA regulations. Specifically, specially trained personnel were able to easily move and operate the laser scanner, while utilizing a ropes and harness system to ensure their safety. Because of the limited amount of time for data collection (50 hours), special care was taken when defining the the variables for this project, including data density and determining which portions of the site needed to have color information (photographs) included with measurement data. By addressing these issues prior to the implementation of the project, the time on-site was utilized efficiently, and the quality and quantity of data collected was maximized. As with many construction projects one must utilize the appropriate tool for the appropriate job. In this case, the different areas that required documentation dictated the use of different types of scanners in order to maximize the efficiency of time and quality of the data. In total, 4 laser scanners were utilized, each controlled by its own operator. Two Leica C10 laser scanners were utilized to complete the exterior documentation, as well as the documentation in the main chamber area of the monument. The reasoning behind using these particular laser scanners is that the time-of-flight technology they employ tends to be well-suited for long-range, low noise data collection. 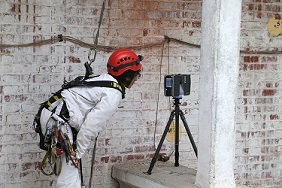 On the roof, attic, and basement levels of the memorial, two Faro Focus 3D scanners were utilized. With their fast phase-based scanning technology, these scanners were perfectly suited at collecting hundreds of scans in the basement area, over a short time period. In addition to this, the small form factor of the Faro Focus 3D scanners made them an ideal choice for the work that took place on the upper levels. Other critical considerations in the project (and with any project) included defining the extent of the area that needed to be documented, point cloud density, and point representation. Point density, or scan resolution, is important because this value determines the number of measurement points collected during the scanning process. If objects/areas of interest have small, intricate features, higher resolution scans will better describe these areas, but will also take longer to collect. If more general measurements are needed, perhaps lower resolution scans will suffice. Point representation has to do with how the data will be viewed or utilized down the line. If the data is to be used in visualizations, color data (i.e,. photographs) collected with the measurements can add tremendous value, though it will add additional time to both data collection and data processing. If the goal is merely to collect quick measurements for verification or as-builts, color data may not be necessary. The Lincoln Memorial project is just one small example of the power of 3D laser scanning. In the construction industry, the site is a dynamic, ever-changing, living, breathing location. 3D laser scanning can be utilized at any point in the process, whether for the basic, initial survey at the beginning of the project prior to breaking ground, as well as during the construction process to verify that the intended design is being closely adhered to. Once the final piece is in place, 3D laser scanning is the ideal starting point in generating an accurate, comprehensive BIM model for owners, contractors, and architects. Though laser scanning can and will be a tremendous addition to existing workflows, the key is knowing how to apply it effectively to accomplish your goals. The next time you find yourself needing fast, accurate measurements, give laser scanning a shot. You’ll be glad you did.